Web3 / Web 3.0 / Decentralized Web / Decentralized Telecoms / Decentralized Communications has been a theme of TADSummit for over 3 years. While it’s still a way out from broad market adoption, we’re starting to see real commercial deployments, as we’ll describe in this weblog. Status, an Ethereum OS, was a sponsor for TADHack Global 2018. The future is here with respect to the decentralized web, it’s just not that evenly distributed. We kicked off the session with Ben Parsons from Matrix, providing an update on their activities. Earlier this year Status invested in Matrix, a wise decision. Ben provided an intro to Matrix and focused on their the achievements this year. As Ben went through the achievements it reminded me of Rob’s Centralized/Decentralized presentation and how we’re approaching a crossroads. The explosion of matrix clients is critical for improving users’ experiences, and meeting a variety of use cases to broaden adoption. The BIG announcement was their selection by Direction interministérielle du numérique et du système d’information et de communication de l’État (DINSIC) . This national deployment is a turning point in decentralized enterprise communications. Next we were lucky to have David Dias, given his crazy schedule, make the time for us. It was great to see his presentation review Protocol Labs progress linked to his TADSummit presentations. One of the Innovation Showcase presenters, Computes by Chris Matthieu, which is based on IPFS; had to pull out as they were recently bought. Its a hot area! Web3 has 3 building blocks: linked data web, blockchain, and the decentralized web. It’s important to understand this is not some standards-led initiative. It’s many projects around the world with lots of real world experimentation. 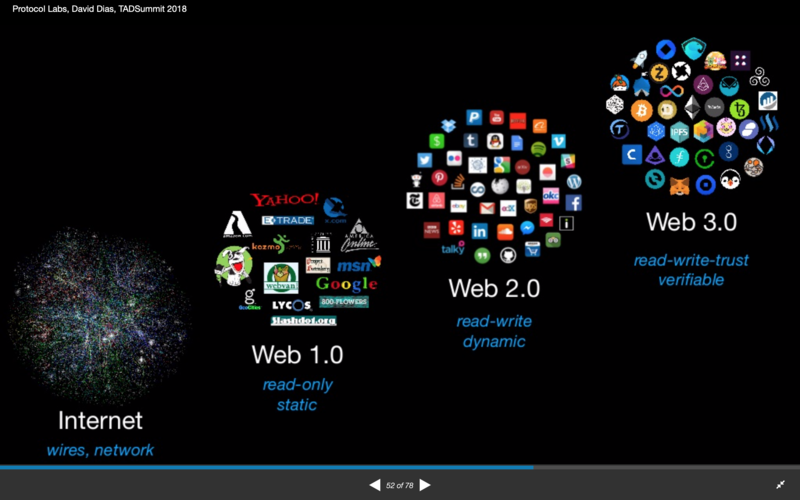 Web3 is evolving, rather than being standardized. One point David raised was the importance of Identity. This linked back to the keynote presentation given by Marco Lafrentz of tyntec on Hybrid authentication. David shared the work they’re doing in this space. Though-out my career, the best work I’ve done is by a combination of experimentation and thinking. I view it simply as I’m not smart enough to understand a problem fully, only by poking at it in the real world can I work out how to solve it. I view the approach Protocol Labs and the whole Web3 community are taking as a global implementation of this approach. It’s early days, however, this is one to watch and understand. Dean gave an excellent review of blockchain and its relevance to the telecom industry. His dichotomy slide between centralized / decentralized echoed Rob Pickering’s presentation, across many more use cases. He highlighted many potential application areas, see slide 7, which is a really good heat-map. And as Dean pointed out, its early days, but this is one to follow and understand. And we wrapped up the session with Paulo Chainho from Altice Labs providing an implementation update on the reThink project. ReThink were a sponsor of TADHack Global in 2016. It’s great to see work from there being realized into the project Sharing Lisboa. Well done Paulo! And thank you for providing the location for TADSummit 2018.